This is my boy, Hendrix! Hendrix and I met on Valentines day 2012 when he was just four weeks old. By seven weeks he was independent enough to come home with me. His ears were standing on their own by five weeks! 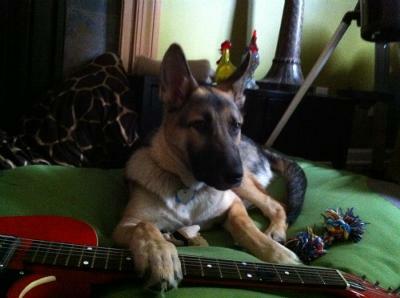 When I got him home he took a keen liking to my guitars and loves to play with them. He's such a good boy and loves to please. He's about six months old now and is a getting a little defiant, but understands when I correct him. He learns fast! He chases the cat sometimes, but he's working on his inhibitions and it's more of a playful thing for the both of them. We have four Dachshunds who do not really approve of him since his ears stick up and he has long legs, but they're teaching him how to behave in the house. The other day we were outside washing my car and a jogger passed by. He came and sat right against my leg and got his big boy voice for the first time! I had to let him know that it was alright for her to run on the sidewalk, but that he was a good boy for letting me know somebody was coming. He knows how to sit, lay down, stand, shake, hi-five, leave the ball, and go to his crate on command. He loves belly rubs and just generally loves being in his body! I couldn't be more happy with my boy and I look forward to many years of friendship with him. 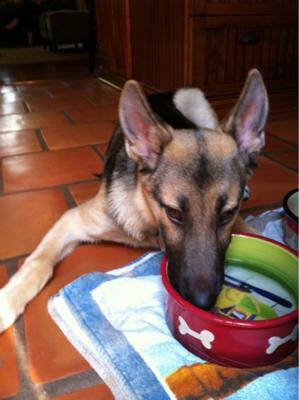 Thanks so much for sharing your wonderful German Shepherd puppy, Hendrix, with us all here at Total German Shepherd. He is a handsome boy for sure! I love the name - very unique and not one that I can ever remember for any pet I've ever known. It seems to fit him well! And you're not too far from us here at home base too - very cool. I wish you nothing but the best with your handsome young man. 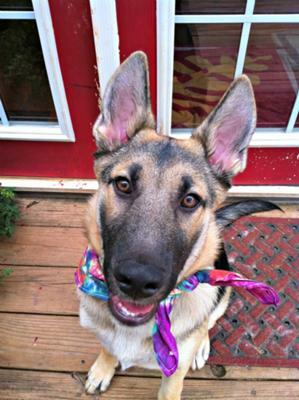 Hendrix sounds to be a classic German Shepherd through and through - in both abilities, personality and looks too. Good luck with him and keep us up on how he's doing later on. What a Handsome puppy Hendrix is! I couldn't think a better present than Hendrix for Valentine's Day. He is maturing so fast. He is already in his "protective" mode and he is learning quickly. He likes playing the Guitar,mmmm like Jimmie Hendrix. Even when they are puppies and get a little bossy you must let them know, who is the boss. 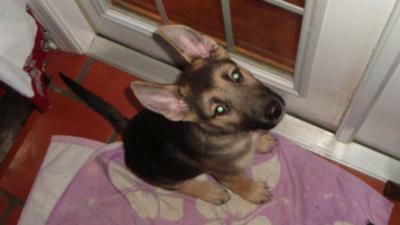 Read our story GSD puppy Mia and Mia My Beautiful German Shepherd Dog. Wishing the best for Hendrix he will be your protector no doubt. Take care of you Boy, Hendrix and he will take care of you. Thank you for sharing your story of Hendrix. I love your photos. Hendrix is really handsome! ; & he will bring you so much joy!